In 2017, Road Atlanta celebrates the 20th anniversary of the first Petit Le Mans, now considered one of the most prestigious events in the world of sportscar racing. The Michelin relationship ushers in a new era to this year's 20th Anniversary Motul Petit Le Mans and unites two stalwarts in the motor racing world. 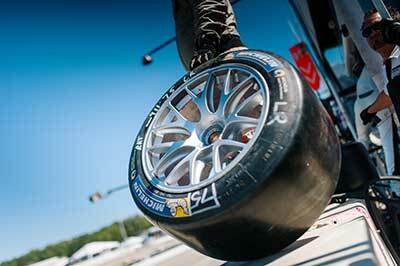 "The data and insights that we gain from testing and racing at Road Atlanta is extremely valuable to our Michelin engineers, both in developing our tires for competition and for our Pilot Sport family of ultra-high performance tires, like our new Pilot Sport 4S," said Sarah Robinson, manager of motorsports marketing, Michelin North America. "The Road Atlanta circuit features some of the most challenging elements that the cars and tires experience throughout the IMSA season across all 12 race tracks. The fans of Road Atlanta are passionate and highly tuned in to racing, and the teams and drivers are always at their best at Petit Le Mans with the prestige of the race and the series championships on the line," said Robinson. At the conclusion of the 2016 IMSA WeatherTech Championship season, both Michelin and IMSA chose Road Atlanta as the location for the series official GT Le Mans (GTLM) class tire selection test, a further tribute to the character of the race track. "Michelin has been a pillar in the world of top-level road racing, so to welcome such an international company on as the official tire sponsor of Road Atlanta seemed like a perfect fit," said Geoff Lee, president and general manager of Road Atlanta. "Michelin has such rich history and success on the hallowed grounds of Road Atlanta, and it being their U.S. home track, this is truly a homecoming." Michelin branding will be prominent throughout the 750-acre facility, including covering the famous spectator bridge on the front straightaway. For Michelin, such bridges are both literal and symbolic as a connection from the spectators to the race paddock and in representing the exchange of technology from the race track directly to the consumer. The 20th Anniversary Motul Petit Le Mans four-day festival of speed kicks off on Wednesday, October 4 and culminates with the 10-hour IMSA WeatherTech SportsCar Championship season finale on Saturday, October 7. Michelin designs, manufactures and sells tires for every type of vehicle, including airplanes, automobiles, bicycles, Earthmovers, farm equipment, heavy-duty trucks and motorcycles. The company also publishes travel guides, hotel and restaurant guides, maps and road atlases. Headquartered in Greenville, S.C., Michelin North America (www.michelinman.com) employs more than 22,650 and operates 20 major manufacturing plants in the U.S., Canada and Mexico.